You probably have an old pair of jeans that you've outgrown, or maybe it has rips or is just out of style. 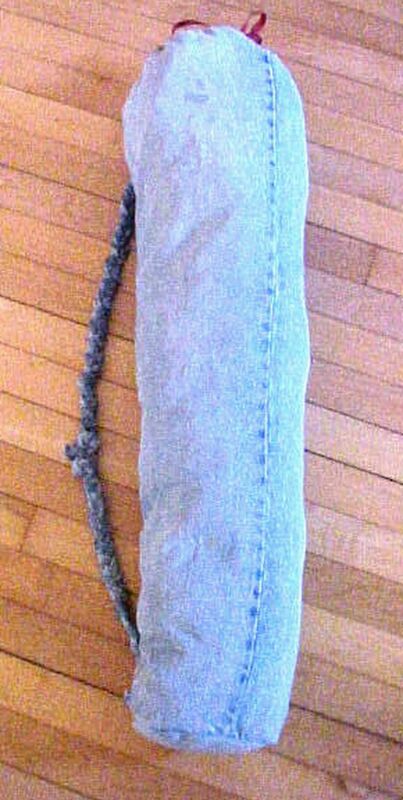 Don't throw them away: Repurpose your old jeans—and save money in the process—by making a yoga mat bag from them. The process requires just a few basic supplies and 15 minutes of your time. If you're really artistic or you are a wiz as a seamstress, you can get fancy and use free yoga mat bag sewing patterns. But the steps that follow will allow you to create a perfectly serviceable yoga mat bag for just a few pennies (and your old pair of jeans, of course). Read on to find out how to make good use of those old jeans, and go to your next yoga class in style. Measure the length of your yoga mat, and add 6 inches. Then cut off one of the legs of the jeans at the same length. Cut a circle from the remaining leg to serve as the bottom of the yoga bag. It needs to be at least 2 inches bigger than the opening at the bottom of the leg all the way around. Flip the cut leg inside out, and pin the fabric circle to the bottom of the bag (with the good side facing in). Stitch it in place. Then, flip the bag right-side out when you're done. Sew a 1-inch hem at the top of the bag to hold the drawstring. Include two holes for the drawstring to go through. Cut a length of ribbon to serve as the drawstring for your bag. Then, thread it through one of the drawstring holes, and work it around to the other side. Continue to tug on the ribbon until it is even on both sides. Finish by tying a knot at each end to prevent the ribbon from slipping back through the holes. This step can be a bit frustrating. So, untwist a metal coat hanger, tie the ribbon around one end, and use it to guide the ribbon through. Create a strap for your yoga mat bag by cutting a piece of ribbon to the length of the bag and stitching it in place, or if you prefer, create a denim strap by cutting three strips of fabric from the remaining leg, and braiding them together.